The healthy growth rate of end user industries in developing regions of Asia-Pacific and Western Europe will positively influence the global market for specialty carbon black. The total production of commodity carbon black stood at 14.26 Million tonnes, whereas the consumption accounted for 73% of the total production. 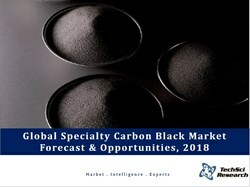 The global market for specialty carbon black is expected to grow at the CAGR of over 5% during 2013-2018, in terms of volume, according to the recently published report by TechSci Research ‘Global Specialty Carbon Black Market Forecast & Opportunities, 2018.’ The report provides critical insights into this specialised market. According to it, the major share of the specialty carbon black market is held by Cabot Corporation. It adds that the global market for specialty carbon black is highly consolidated, and is dominated by four players, i.e., Cabot Corporation, Orion Engineered Carbons, Birla Carbon and Continental Carbon. However, it is expected that manufacturers of carbon black will increase their focus on specialty carbon black during the forecasted period. Specialty carbon blacks are pure and more crystalline form of carbon as compared to commodity blacks used in the manufacture of tyres. Specialty grades have diversified the market for carbon blacks, by extending its usage in inks, plastics and coatings. Specialty carbon blacks constitute 9% share in global carbon black market while the rest of the market is held by rubber and commodity carbon blacks. In 2011, the global market for carbon blacks witnessed an overproduction of commodity blacks. The total production of commodity carbon black stood at 14.26 Million tonnes, whereas the consumption accounted for 73% of the total production. The TechSci Research report mentions that the market for commodity carbon black in North America and Western Europe is declining as a result of oversupply and will continue to decline over the coming years. This is persuading the manufacturers of carbon black to increase their emphasis on specialty carbon black. In addition, the end user industries in North America and Europe are targeting high-end quality segment for plastics, as well as printing inks, for which pure specialty carbon black is required. ‘Global Specialty Carbon Black Market Forecast & Opportunities, 2018’ reveals that the major end user industries of specialty carbon black are plastics, printing inks and coatings, which account for a combined share of 90% consumption in the overall market. Thus, growth of these allied industries is expected to positively impact special blacks market. The major driving factors are healthy growth in these industries coupled with increasing penetration of pure form of carbon black. Thermoplastic elastomers is one of the major application industries for pigment blacks, and is expected to witness healthy growth during the forecasted period, positively impacting the overall specialty carbon black market. Manufacturers of specialty carbon black are introducing eco-friendly products, which are expected to increase the penetration of these compounds in coatings market worldwide. “The growing digitization and digital printing have influenced the market for ink-jet printing inks, which require specialty carbon black in order to provide required characteristics to the end product. In addition, special blacks are also an integral component of thermoplastic elastomers and electrostatic dissipation applications, which is further expected to drive the market for special blacks, globally,” said Mr. Karan Chechi, Research Director with TechSci Research, a research based global management consulting firm. ‘Global Specialty Carbon Black Market Forecast & Opportunities, 2018’ has analyzed the potential of the specialty carbon black market globally and provides statistics and information on market sizes, shares and trends. The report will suffice in providing the intending clients with cutting-edge market intelligence and help them in taking sound investment decisions. Besides, the report also identifies and analyses the emerging trends along with essential drivers and key challenges faced by the industry.